Tags are the medium used to facilitate the collection and sharing of data between your website and the various technologies you utilize that rely upon this data (e.g. analytics platforms, marketing vendors). With rapid expansion of the digital marketing ecosystem there are thousands of marketing vendors that each have their own tag (or multiple tags) that they wish you to add to your site to enable them to turn on their technologies and facilitate your digital marketing initiatives. Today sites can incorporate dozens to hundreds of these third party tags, and with this come challenges pertaining to implementation agility and speed, data quality, transparency and control over data collection, performance loss from the loading of tags, etc. Tag management solutions (TMS) have been developed to solve for a myriad of these challenges and to make the management of tags simpler and easier for both technical and non-technical users. A tag — sometimes referred to as a pixel or beacon — is the means by which data is collected on a website. What do tags look like? Where are all these tags? Integrate third-party content into a website (e.g. social media widgets, video players, ads, etc.). Everything from ad campaigns to Google Analytics runs on tags. What’s the difference between a tag and a cookie? Tags are not cookies and cookies are not tags. Rather, a tag can be used to set a cookie. Cookies are text-only strings of code placed on a computer or device for a variety of purposes including remembering a user’s preferences or the contents of their online shopping cart. What kind of data can be collected through a tag? User Behavior: Data including the products, content or ads you viewed, links clicked, time on the page, etc. How many tags are on a typical website? The average enterprise website may have anywhere from 50-150 third-party tags on the site at any given time. This number doesn’t reflect the high volume of fourth-party/piggybacked tags that are often appended to existing tags already in place. Third-party tags represent a wide range of data-driven applications including analytics services such as Omniture and Webtrends to digital marketing services that power social media, video, advertising, retargeting, search, etc. Some service providers offer more than one tag for various products in their portfolio which can contribute to the number of tags on a brand’s site. How do tags collect and send data? What are some of the pain points associated with tags? Despite a tremendous amount of innovation in online marketing, the tag-driven method of gathering data from website activity has not changed since the 1990s. Tags often create internal conflict between marketing, IT and privacy stakeholders and can introduce pain points for everyone involved in online marketing. Control and Ownership: When a site owner puts third-party code on their site, control over the data collection process is ceded to the third-party provider. The more tags, the more third parties with control over the site owner’s data. Implementation: The traditional process of managing multiple third-party tags is a well-known operational challenge that requires site owners to place custom code on specific pages of their site. For many large brands, this typically requires the IT team to make the changes as part of a scheduled deployment process which can delay campaigns and lead to lost revenue opportunities. Privacy: Multiple tags on a website put privacy at risk because third parties have access to the data collected on the site (see Control and Ownership above). Also, many brands must adapt their sites to comply with privacy regulation across markets and geographies which becomes increasingly difficult when data collection is in the hands of third parties. Performance: Every new tag added to a site can introduce additional latency and degrade the customer experience. It is the end user visiting the website who bears the brunt of this overhead when they load pages containing hundreds of lines of third-party code. Data loss: Sometimes tags fail to fire. For every failed tag, data is not collected and revenue opportunities may be lost. Piggybacking: It is possible for tags to be chained together through a process called “piggybacking.” This enables tags to be appended to existing tags already in place on the website without making any changes to the page code. Piggybacking can add dozens of tags to a site and introduce services that the site owner may not be aware are on the site. Read more about the history of tags, tag containers and piggybacking on the “History of Tags” page of our website. What is a tag container? The tag container was originally introduced a decade ago by the major ad networks as a way to add a lot of tags to a website and manage them all in one place. Most online marketing professionals are familiar with Doubleclick’s Floodlight tag or the Atlas Universal Action Tag (UAT). What are the limitations of tag containers? 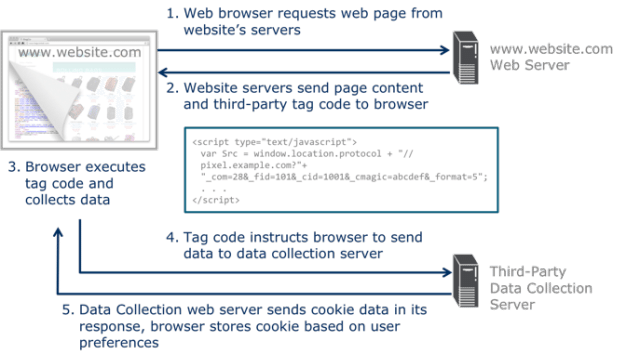 At its core, a tag container is still sending third-party code through the end user’s browser putting data ownership, performance or privacy at risk. There is also a danger of data loss for the site owner and third-party provider when browser tags don’t fire properly. Tag containers do not solve for the inevitability of tags going dark. When it comes to scalability and performance, tag containers are dependent on optimizations to the browser which is yet another third-party service the site owner does not control. Is there an alternative to the tag container and tag-driven approaches to data collection? Yes, we’re so glad you asked! Signal’s vision is to fundamentally solve the problems that have emerged from the industry’s now outdated marketing infrastructure. Through technical integration with third-party service providers, Signal makes browser-based optimizations a non-issue by eliminating third-party tags from the browser and delivering data directly to partners through the cloud. Technology has come a long way since the 1990s and Signal believes the future is a world where tags no longer get in the way of faster websites, better data-driven marketing programs and innovation for everyone. What's Your Data Collection Strategy?